Natural Frequency Feeders are energy efficient and designed to handle high capacities, while maintaining stroke under extreme headloads. Carrier’s two-mass subresonant vibrating feeder drive systems utilize heavy-duty coil springs, delivering a linear angle of attack along the full length of the feeder pan. Travel speeds up to 60 feet per minute. 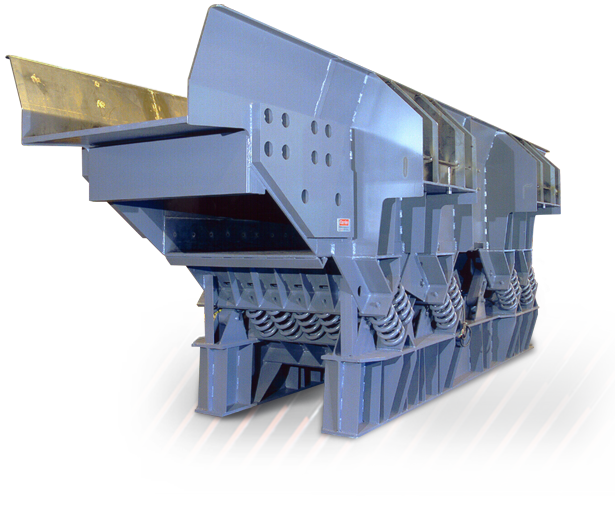 High temperature vibrating feeder designs available for handling materials up to 2000 deg. F.
Choice of construction from carbon steel to metal alloys. 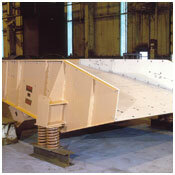 Polished vibrating feeder trough and special coatings available for sticky products. Provides robust operation in the most demanding conditions. The design also requires relatively low horsepower. 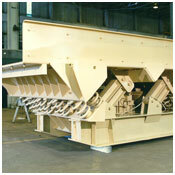 Vibrating feeder capacities to 3,000 tons per hour. Tuned, two-mass, natural frequency and direct-drive designs. Widths from 12 inches to 10 feet, and lengths up to 25 feet. Options include scalping or screening decks, removable dust-tight covers, overhead drive arrangement, abrasion resistant liners, explosion-proof designs and more. 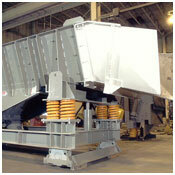 For more information on Carrier vibrating feeders, refer to brochure #16906, #16905 and #16615.